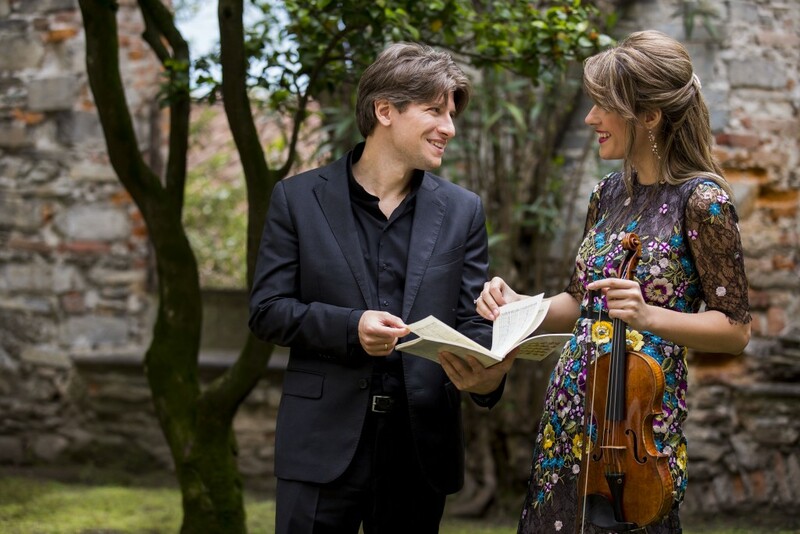 Violinist Francesca Dego collaborated closely with her husband, conductor Daniele Rustioni, on a new album for Deutsche Grammophon. Here she describes how their romantic relationship transferred into a working partnership, and why she would not have been able to achieve the same result with anyone else. Is being married to another musician the perfect example of a symbiotic relationship? It’s a question I’m frequently asked, as my significant other happens to be conductor Daniele Rustioni. I usually reply that music isn’t a democracy and that our roles are defined automatically when we work together, which is definitely a good thing. We never discuss anything in front of an orchestra and in any case, as a soloist, I rarely address the musicians myself, so it’s not a challenge to be completely professional. That said, no other conductor in the world knows me nor my playing as intimately as Daniele does. When we perform together I can trust him completely, knowing he’ll always anticipate any input and nuance on my part. You could say it’s a greater responsibility for both of us, as there is less left to chance and an increased sense of duty towards the other person. We always want to be at our best, but in addition need to feel we’re supporting each other unreservedly without adding stress factors. Our work absorbs us completely, every day, but at home we are a very normal couple, dealing with daily issues and trying to make our schedules coincide from time to time. I feel that the investment one has to put into a relationship is comparable to the discipline required when playing and conducting: it is a constant search for perfection, and as we are both conditioned to work hard to reach our goals, it reflects in our harmony as a couple. On the other hand, I consider music the most profound mirror of human nature. It puts us in touch with our deepest emotions: despair, jealousy and passion. Being immersed in such a tangle of feelings all day can be difficult to cope with at the best of times, but when you are working with someone who knows you so well, potentially it can become a time bomb. Regardless, I’m still convinced that the positives infinitely outweigh the challenges. We recently had the chance to test out our working relationship on an exciting new project. When the opportunity to record Paganini’s Violin Concerto No 1 and Wolf-Ferrari’s Violin Concerto for Deutsche Grammophon came up, I was adamant that it would have to be with Daniele. Paganini has been in my musical life forever and I’d worked with Daniele on the concerto in the past, performing it with him on many occasions. This is conceivably the only piece I refuse to play with just any conductor; it is often underestimated, but can become a nightmare ensemble-wise if you’re not working with someone with adequate experience of accompanying opera and deep knowledge of Rossini’s era and belcanto style. I knew that with Daniele we’d be bringing a common idea and expressive intent to the recording. In fact, my relationship with Daniele has only deepened my love for Italian music. Following his opera performances and observing his work with singers over many years has repeatedly exposed me to the great Italian repertoire, which I adore. I’m fascinated by how complex it is; the miracle that occurs when every little piece of the puzzle falls into place and fits perfectly. Singing has always inspired me, so listening to opera is a wonderful experience, gifting me with all kinds of phrasing and pacing tips. We began by the project by marking up CBSO’s orchestral parts, and then met with my mentor Salvatore Accardo to discuss details in the score. This meant we were well prepared and harboured no doubts about what we wanted to convey with this project. All this would have been impossible with anyone other than Daniele, especially with today’s scheduling limitations. Daniele was particularly helpful in the research phase. I was looking into lesser-known Italian concerti, hunting down rare recordings and impossibly hard-to-find scores when I came across Wolf-Ferrari’s concerto. It was a very important musical discovery for me – a work that really stood out. Daniele was an enormous help, sitting at the piano and reading through repertoire with me, so my relationship with Wolf-Ferrari is closely connected to him. That connection is appropriate given the conceto’s origins. Inspired by love, is was dedicated to Guila Bustabo, a young American violin star. The ageing composer became infatuated with Guila and wrote the concerto “for her and her alone”. I feel this is the ideal romantic concerto – operatic and deliciously magniloquent, but also tender and elegant, a psychological refuge from the horrors of war; anachronistic but vivid and communicative. Wolf-Ferrari was an opera composer: true theatre, with its many effects and uninhibited emotions, bursts from each note. I cherished every moment working on this piece with my husband, as we constructed our own interpretation with precious little pre-existing material to go on. Playing the UK premiere in Birmingham’s Symphony Hall was thrilling for us and I’m sure our love for this piece will be evident (and contagious!) for whomever listens to the recording. Francesca Dego’s new album Paganini – Wolf-Ferrari will be released 27 October on Deutsche Grammophon.